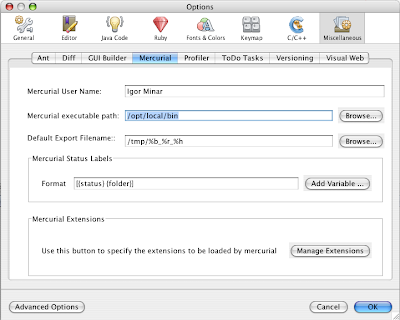 The problem, I encountered already twice, is that if the Mercurial executable path is not set up properly, the Versioning->Mercurials menu item is disabled and NetBeans doesn't give you any hint as to what went wrong. For some reason the path on my Mac is by default pointing to my python directory, which is not correct. Once the path is corrected and the IDE is restarted, everything works as expected.